Windy Hill Zone as it appears in Smash. Windy Hill Zone (ウインディヒル, Windy Hill) is a stage in Super Smash Bros. for Wii U and Super Smash Bros. Ultimate. The stage is set in the first Zone of Sonic Lost World of the same name. Windy Hill Zone consists of a large main platform, with three smaller platforms above, and a giant moving windmill on the right. The windmill acts as a surface, with platforms connected to each blade, and a portion of the windmill goes past the blast line. The windmill's rotation and speed will also occasionally change during the match. The main platform consists of a point-like center of gravity; so jumping or getting launched upwards from the edge will cause the character to move diagonally. As the match plays, 2 double-sided springs occasionally appear at both sides of the bottom blast lines. Players who come in contact with a spring will be pushed a distance. When they spin around, they can KO fighters on the bottom and side blast lines (and if a fighter is fast enough, the upper blast line). Seven Animal friends (Flicky, Pecky, Picky, Pocky, Cucky, Ricky, and Rocky) from Sonic the Hedgehog can be seen in the background. In Super Smash Bros for Wii U, the Ω form is set on a completely flat version of the regular form's main platform, and the gravity is normal. Springs and soft platforms are also absent. In Super Smash Bros. Ultimate, the Ω form and Battlefield form are similar to the Ω form in SSB4; however, the main platform is resized and reshaped to match Final Destination and Battlefield, respectively. The three soft platforms of the Battlefield form are made of wood logs that are unique to this form. Battlefield form in Super Smash Bros Ultimate. Windy Hill, as it originally appeared in Sonic Lost World. Windy Hill Zone first appeared in the game Sonic Lost World. Windy Hill is the first world in Sonic Lost World and is a lush grassy area full of plants and trees. It also contains checkerboard pattern soil, which is similar to how platforms were in the first Zone of Sonic the Hedgehog, Green Hill Zone. The windmill from the level is also present. In Super Smash Bros. Ultimate, the Battlefield form features three soft platforms that resemble the bridges made of logs that appear in Zone 2 of Windy Hill Zone. Springs first appeared in Sonic the Hedgehog and were either colored red or yellow. They were usually used to allow the player to access higher parts of the levels, or, if the spring is sideways, to make the player run faster. Springs have appeared in numerous Sonic games since, but the design was changed in Sonic Adventure and has remained the same since. The new design features the spring being red and blue with a yellow star in the center. This design, however, first originated in Sonic the Hedgehog as the Bobbins (also known as "Bumpers") in Spring Yard Zone were designed similarly. 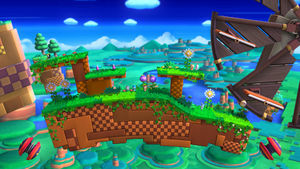 In this stage, there are springs on each side and their design is based off of their appearance in Sonic Lost World; however, there were no springs that were back-to-back in Windy Hill. The animal friends are recurring characters in the series, having first appeared in Sonic the Hedgehog (with the exception of Flicky, who first appeared as the protagonist in the arcade game Flicky). They are used by Dr. Eggman, the series antagonist, as living power sources for his robots, and destroying one of these robots will free the animal inside. They also make an appearance in Sonic Lost World where they play the same role, but can additionally be collected to unlock new levels. This stage is banned from tournaments, due to its size, gravity effects, and the springs and windmill allowing for camping. In Ultimate, the Ω forms and Battlefield forms are also banned due to the grass being dense enough to hide traps set by Snake and Isabelle. 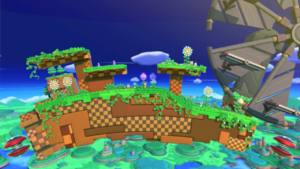 A pre-release version of Windy Hill Zone in Super Smash Bros. for Wii U without the animals in the background. Sonic taunting in the stage. Sonic and Mario in the stage. Sonic and Mario fighting in the stage. The animal friends seen in the background. Characters can be Star and Screen KO'd diagonally on both this stage and Mario Galaxy. Under extreme circumstances, it is possible to abuse the curved gravity of the stage to stay airborne indefinitely. For example, if Jigglypuff is equipped with two thistle/floaty jump badges and the gravity is set to light, then by pushing against the side walls of the stage, Jigglypuff will move upwards until the control stick is returned to the neutral position or it grabs the ledge. This page was last edited on April 16, 2019, at 02:00.